Church Doors Closing – Good or Bad? I’m just throwing this question out there cause i’m not sure what to conclude about it myself. When church doors close because of financial hardship is it good or bad? I know some of you are thinking immediately that its bad. But think about it. That’s one less mortgage bill that has to be paid and that’s more money towards the poor, and other needs. Let’s face it, giving statistics state that 85% of what a church brings in is spent on the internal operation of the church. Let’s put this in perspective. If Paul was called to minister to the gentiles but he spent 85% of his time with the jews, how effective would Paul’s ministry be? Let’s put this another way, if God calls us to go and teach all nations, and seek and save the lost, but we spend 85% of our resources on ourselves, how effective can we be? The truth of the matter is that giving statistics state that the church only spends 3% on directly ministering to the unsaved. Let’s ask the question again, if only 3% of a church’s resources are going towards ministering to the unsaved is it good or bad that a church closing its doors frees up the other 97%? God is not for sale or for hire! He gave/gives freely and has made it quite clear to me … “YOU CANNOT SELL WHAT I GIVE TO YOU FREELY”. I admit, I have felt the temptation for easy money from hurting souls, (in biblical terms, “making merchandise of His people”). Many have gone that way. He also gives us the penalty …. “death, eternal separation, darkness, suffering, Hell, etc.” Enough deterrent tp pass on the temptattion don’t you think? PS: We’re not to condemn each other, (ref: Michael telling satan the Lord rebuke you … he/Michael wouldn’t do it) which is another very tempting thing. I didn’t feel those things in David’s emails, but then again it is highly quesionable to ask for a loan ove the internet. No one should do that! Let’s consider this: if David want’s to come to the USA and gets here on his own, we can meet him at the airport and help him reconnect with his daughter and see that his daughter can afford to put him up until until his next month’s check. That’s minimal cost. David … if you’re reading … we will need your agreement and the details to make the connections. It’s up to you, and I will help under these conditions. Be careful the bible says in Proverbs that “a fool believes everything ” Many con artist use the bible to steal from christians even in church . If David chooses to come to the USA and be with his daughter I have no problem helping and in fact would be happy to help. I think the terms I spelled out are safeguard enough, and honestly it would not be enough $ to lose sleep over. Intent of the heart is important to God and covers many errors in judgement. And I can’t fault David or anyone else about thinking tithe 10% and such to an organization, and I do believe that tithing and offerings in the form of money, time, etc. is appropriate in some form. It’s the infighting over doctrine that the scriptures warn us about. Like politics, the pendulum can swing too far both ways. Besides I won’t lose a brother over tithing or any other non-essential doctrine. Many christians are being set free from lies taught all over the world because of lies about money tithes many pastors promote to line their pockets . To set you mind at ease you can come see me in Manson, NC. Your combative and snide remarks are a poor reflection of the Christian nature. It actually reflects more of the “wolf” you are accusing others of. Just know … I forgive you and … I won’t respond to any future “mad” correspondence from you. Only a fool beleives everything ,thats what the bible teaches not a wolf. For your information a wolf ask for money and manipulate others so they can get what they want whether they use the bible or any means to get it . I do not need any money from you or anyone on this site God is my provider not you or your friend David Glass . A leech has two sons their names are Give and Give , thats what the bible says so if your pastor or any christian ask for money all the time remeber that verse. Is there any way you can prove to us you are not David Glass ? I think Joel was just being careful he was not the one asking for money it was David Glass .Why are you suddenly upset with Joel ? 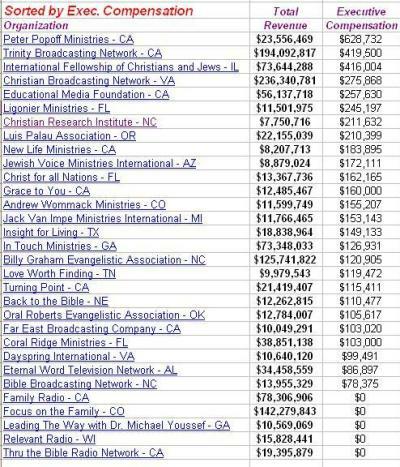 Are you using two names to try and get christians to give you money ? Your comments sound a little suspicious to me . I’ll do my best to prove it, but in fairness I ask you to do the same in regards to your relationship to Joel. I have a facebook page (although i don’t like Facebook). Gary Morgan, Manson, NC. If you know computers, that’s pretty much all the info. you need to find out about me. If you’re legit, I’ll expect the same from you. Secondly, unless you and other think I have dual personalities, anyone who looks can see that the writing styles, thought processes, etc. for me and David are different. As for wolves and answering your question regarding Joel … Why would I be upset? I’m as sincere as can be and believe that anyone who berates others as Joel has done needs to have a taste for him/her self. After all, we are supposed to protect the meek, right? And as for how to identify WOLVES, it’s not just money and in fact money takes a back seat to their need for influence and control of others. In my opinion that’s usually includes harsh comments about others who do not yield to their doctrine. So, if it’s not in accordance with James 3:17, it’s at a minimoum suspicious. Can you not be careful w/o being hurtful or accusatory? Why are you so upset with me ? Where is David Glass and why is suddenly not commenting but you are the one upset now . When you have been a victim of christians you lend money to then you will understand but for you suddenly calling me a wolf is completely out of ordinary and a bit immature . I did not try to solicit any money from you or anyone here and you dare point your finger at me . Its intresting suddenly David Glass disappear and you are the one offended ? You said that I want to control and influence others . I have no intention to influence you or control you or anyone on this site . I am the one who was asked for a loan not you or anyone but now you are blaming and accusing me for trying to influence and controling people . Its a bit strange that you are upset with me when I said to David Glass that I will never give him any money . You are now turnning everything around and make me look bad because I said no to David Glass ? I dont think its a doctrine to say no to someone you do not know if they ask you for money. Joel was harsh when he replied to David Glass but that does not make him a wolf or a con artist .I have a few friends who were caught up in a scam involving a pastor and they lost all their life savings .To react to someone you dont know and label them wolves is really insensitive and inconsiderate espeacialy you do not have all the facts . Well joel guess I haven’t gone away I was just tired of all the slagging off when you really don’t know what tou are talking about, and as for the clip Jare showed from my enail , it e]was just a clip , for the wholr thing would need to be shown and the commented on.I sent it asking what was wrong with this email as I believe that all of the Family of God should help one another. I have already posted now several times that if I offended anyone, before God I am sorry, but everything has been taken out of context and I wish you would just get your minds renewed to the the things of God. I have also sent in saying that if I am wrong thinkink that the Body of Chridt is not allowed to aid each other and I am wrong, then I am answerable to The Lord, no one else and He shall deal with me as he sees fit. I am going to dend a couple of emails that might take your minds off all this nonsense and it mat also bring you back doen to earth. David Glass. Each week millions of Christians call upon God for revival, but revival does not come. We ask; why God … why do You withhold revival from us? Perhaps in response to His silence we should first examine our request. Do we really understand what we are asking for and, once understood, are we really prepared to go after it with passionate abandon? Revival is an “awakening” of consciousness [by] the Spirit of God. It is God first … ourselves last! It is the hope of a joyous eternity with the Lord over momentary earthly desire! It is always honorable, always courageous, and always filled with Holy Ghost power! It is generous and sacrifices no one! It is the enemy of the world! And it is obedience to God’s word! You know the saying; If you continue doing the same thing, you will continue to get the same results. Then if we truly want revival, shouldn’t we examine our practice of Christianity to ensure that it is in line (obedience) with scripture? Our services and actions must be focused on the worship of God and obedience to His word, and not business finance or programs. Examples: The scriptures clearly command “Quench not the Spirit” (1 Th 5:19), but we do just that when, after ushering in the Spirit of God through song and praise, we take our hearts and minds off God by stopping short to collect the offering. Also, the scriptures declare that “genuine religion in the sight of God means caring for orphans, widows and the destitute” (Jas 1:27, 2:15). Does that describe the mission and operation of our church and individual Christian walk? Anything other than “yes” is disobedience carrying a deadly penalty (Eph 5:6). So let’s be honest, do we really want revival?, and if so, Are we willing to do what it takes to usher it in? Keep your eye out on HendersonDispatch.com. It usually takes 2-10 days for a letter to print. The relationship with the Lord, Jesus, and holy spirit is rather personal. Weather or not you want to do tithing, offering, or almsgiving is the relationship between you and the Lord. Weather you are saved or not is between you and Jesus Christ. I would like to pray for everyone who has post it here regards to this issue, the Lord will guide each of us to the truth in his plan with abundant mercy and love. “why do you call me good?” Jesus said. “No one is good but God alone. “Teacher” said the man, “all these I have observed from my youth.” Jesus looking upon him loved him. “you lack one thing”, he said. “Go sell what you have, and give to the poor and you will have treasure in heaven and come, follow me”. At that the man’s countenance fell, and he went away sorrowful, for he had great possessions. My son, let not royalty and faithfulness forsake you, write them on the table of your heart. So you will find favor and good repute in the sight of God and man. Trust in the Lord with all your heart and do not rely on your own insight. In all your ways acknowledge him, and he will make straight your paths. Be not wise in your own eyes, and turn way from evil. It will be healing to your flesh and refreshment to your bones. Do not despise the Lord’s discipline or be weary of his reproof, for the Lord reproves him whom he loves, as a father the son in whom he delights. i Hitched all over South Africa, Namibia and did some mitionary work in some countries in the world on my own money by selling my furniture to do so. if you know you are called for a job from above you will give maximum to do so. so the only word in our mind must to be obedient to His voice. i have heard stories from people driving on the hgh ways why they are not going to church anymore. Wrong focus. we must remember that we are the churh and not a bilding. god will never stay in a building, thats why he made you and me to live in. that must be very special. It is not about money or clothes, or any other thing you need in life. Its about obedience.I f we listern and do we will look after each other with a joyfull heart. you will not find selfcenterdness in your heart. We can’t serve God and money, but we can use money to help other people in need. that what you see in front of you will control you. things (and money) must follow you. If you follow the things of the world it will defenitly be your boss. For many years I try to get people togewther to get out of financial debt, but….. with a plan of couse. Just think for moment, what is the most negative thing that keep most of the people on this planet away from good relationship with God. DEBT, FANANCIAL DEBT!!!!! We must owe nobody nothing. We are only here to love each othsr. But greed will make us slaves of the world and we are stupid enough to to give our whole family over to those with the plan. the ola to make us slaves and then we will blame the world and the denominations (you are the church remember) for our mistakes. So next time look at youself as the church and allow Gods spirit to change your heart and you will be a well disciplned churh and you as a individual will be able to take the nations as the churh. Greetings from the Hitch Hiker out of Africa.